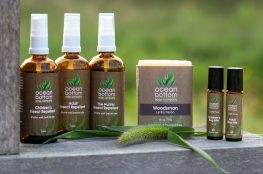 At Ocean Bottom, we’re highly attuned to what our customers are putting on their skin. As we’ve said, your skin is the largest organ of your body. It absorbs 80% of whatever you put on it in 20 seconds or less! Putting chemicals (like those in deodorants and antiperspirants) on your skin may actually be worse than eating them as they enter the bloodstream without any filtering. Deodorant and antiperspirants are loaded with nasty hormone-disrupting chemicals and carcinogens like aluminium, which is used in antiperspirants to block your sweat ducks. If you use a store bought, non-natural brand, check the ingredients list on the label for the word “triclosan”. Triclosan is a registered pesticide. Yuck! 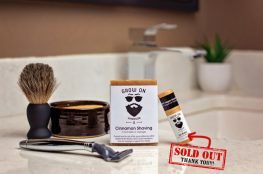 Most people’s concern about switching to natural deodorant is that it won’t work, leaving you stranded with nothing to protect the general public – or your significant other – from catching an unpleasant whiff. So, we had our new shop gal, Suzy, make the switch and report back to us. But don’t worry, we didn’t set her loose without guidance. 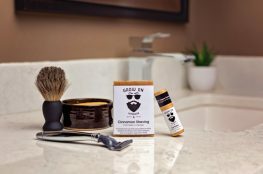 Activated Black Charcoal helps to pull the toxins out of the armpits and clear out sweat glands. Exfoliating Lemon Mint assists with clearing the fluid in the lymph nodes, a key element in the detoxification process. Change isn’t easy, especially for your body. Prepare to be extra sweaty. If you’ve been using an antiperspirant all this time, your body is going to try to resume its natural function, which is to sweat, and it’s going to do so even more now as it pushes the nasty chemicals out of your body. Try to stick to fabrics with natural fibres, like cotton or silk, during this time. As your body tries to rebalance itself, your natural body scent will go through changes. Don’t be alarmed, just notice it. It’s a good thing. Less is more. You don’t need to apply natural deodorant as heavily as you’re used to doing. One or two swipes and you’re good to go. I loved using the Exfoiliating Lemon Mint soap to help detoxify my armpits. It’s not an area of my body I had ever thought to exfoliate before. The natural deodorant application process felt different than typical store bought stuff. Similar to Ocean Bottom’s Lotion Bars, the product softens as it comes into contact with your warm skin, so you need to be a little patient. Once on, the smell of the Lemongrass & Pink Grapefruit was lovely and fresh, just a hint girly, which I like. I won’t lie, there were times as I was going through my “deodorant transition” that I caught myself not smelling the greatest. But, as my body got used to its new normal, I now confidently carry the Lemongrass & Pink Grapefruit scent with me all day long. It even holds up through a workout. I would highly recommend making the switch. I feel so much better knowing that I’m not willingly putting all of those nasty chemicals into my body. I’m looking forward to trying Rosemary Mint Natural Deodorant next.